One of the most common pieces of writing advice is to Show, Don’t Tell. In many cases, that’s good advice, as our readers want to experience the story along with the characters. But as with most advice, that “rule” is imperfect and incomplete. Unless we’re writing a story in the include-every-minute mode of the TV show 24 (and even that show doesn’t include every minute—bathroom stops, anyone? ), we’ll occasionally need to jump ahead in time. The 9 transitions I shared in that Resident Writing Coach post on Writers Helping Writers are all examples of summarizing—or telling—to speed up time and ensure our story moves along. Telling is sometimes required to make our story better. In other words, the standard advice to “show, don’t tell” is imperfect and incomplete because sometimes we do want to tell. Sometimes summarizing is exactly what our story needs. What Does It Mean to Show? “Showing happens when we let the reader experience things for themselves, through the perspective of the characters. … Can the camera see it, hear it, smell it, touch it, taste it, or think it? (And that would be a strange camera.) Because of that, I prefer to think about showing as being in a Star Trek holodeck. Showing: A frosty cloud formed with her breath. Time passes without anything important occurring. Three weeks later, she decided she’d had enough. Characters need to travel or get from Point A to Point B, but nothing important happens during the journey. Once she arrived, she burst into his office. Events occur with no tension or lack conflict, setbacks, or obstacles. For once, her planning worked perfectly, and she soon had the necessary medicine in hand. The activities don’t deserve the emphasis of showing. The game ended up a disappointment, but she wouldn’t have traded the extra time with her mom for anything. Any insights that would be gained by showing would be repetitive. She once again shut down the voices of self-doubt in her head. We want to mislead readers by hiding information in a de-emphasized section. The empty room contained only dustbunnies and a tarnished glint of metal. Adjacent showing sentences benefit from the context of a telling phrase or sentence. The intensity of her anger took her by surprise, burning hotter than she’d ever experienced before. The story’s mood or tone works with irony or other reader-perspective techniques, such as a telling statement that readers know foreshadows the opposite. Everything was going exactly to plan, and she just knew this would be her best day ever. By default, we’d usually show for everything that doesn’t fall into a category like those above, especially if we’re writing in deep point of view (POV). Both showing and deep POV are about giving our readers a “you are there” experience, so they work hand-in-hand in our story. While telling isn't “bad,” our default should be to show events in our story. Click To TweetWriting encompasses many different aspects—dialogue, dialogue cues, thoughts, action, body language, visceral (internal) reactions, setting and description narrative, etc.—and we could spend several posts sharing examples of how telling can lurk in most of those. In other words, we need to be careful not just in some aspects of our writing, but in all aspects. While telling isn’t “bad,” we want to use it consciously, only when we’ve decided that’s best for our story. Rather than naming (telling) an emotion, like “He was angry,” we’d describe the emotion from the character’s perspective. Rather than telling with a flat description, we’d let our character’s perspective and emotions flavor the description. Rather than summarizing important information in narrative, we’d let events revealing the information play out in scenes, so readers learn right along with our characters. Obviously, that last bullet of “important information” is a bit of a catch-all, so let’s focus more on figuring out when something is important. What Makes Something Important Enough to Show? As I’ve said before, stories consist of scenes that connect in a long cause-and-effect chain. In general, we’d want to show the connections between our story’s turning points. If we remove any of those links, our story won’t flow as well. For example, a new goal would lead to new actions—the story would turn in a new direction. If our characters state at the end of one scene that they need to escape the dungeon, readers expect to see that escape play out. If we don't “show” throughout our story's turning points, readers will miss out. Click To TweetIf the story instead summarizes their escape, readers are going to flip back a page and wonder if their copy of the book is missing a chapter. They’re going to feel cheated that they didn’t get to see how the characters pulled it off. Another example would be if the story doesn’t show one of the major beats. The beats on my Basic Beat Sheet are necessary for storytelling. Without showing that scene, the elements of the character’s arc aren’t all fully established. The dots between the “before” and the “after” points become all zigzag-y and randomized. Similarly, if we summarize the Black Moment, the character’s crisis of faith or hope might seem like no big deal to overcome, weakening the story or character arc. The same goes for the other major story beats, like the Midpoint and Climax. If we don’t show those beats, the reader misses out on the strength, depth, and nuances of the goals, stakes, and motivations driving the story, and the story and character arcs are never fully explored. And all of that weakens the storytelling. But it’s not just as simple as showing our story’s major beats and summarizing everything else. The same reason we need to show those turning points—when the story changes—is the reason we’d usually show most of our story. When should we “show”? When readers should experience the journey of change. Click To TweetEditor Jason Black recently posted about the difference between scenes with showing and summaries with telling. And his post made me think about why summaries sometimes work and sometimes don’t. The difference comes down to storytelling—the arc of change for the story, plot, and characters. In short, we need to show change. We need to let readers share the journey or there’s no point in writing a story rather than just a premise or short synopsis. Readers need to be shown all the points of change along the journey. Obviously a shown scene can still contain telling sentences and phrases—such as to give additional context—so our story will always be a mix. But we want to be especially careful and conscious about summarizing whole events. But the reason that event shouldn’t be summarized isn’t as simple as because telling is always bad (as that’s not true), but because the event causes a change in the character: Alina changes her opinion about Teddy. If we instead show the journey through the change, whether that means new stakes or a new attitude, readers will be right there with our story and our characters for the ride. Readers won’t question because they’ll know, just as deeply as our characters do. 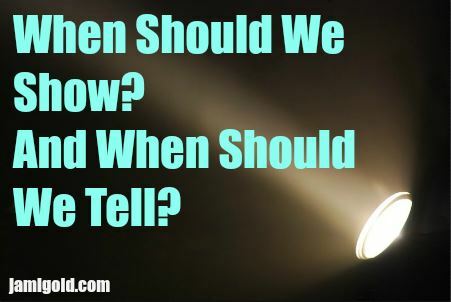 Have you ever wondered when to show or when to tell? Does this post help? Can you think of any other situations when telling is best? Do you disagree that showing should be the default? Do you have any other tips for how to decide between showing and telling? Stories are almost always a blend of show and tell. Some things also can’t be shown (character motivation) or told (conclusions the narrator doesn’t draw from what they perceive). And then some narrators, like AIs, are likely to jump straight to telling things. Writing style and genre can also make a difference for the genre. My dark fantasy series that warps fairy tales skews a bit old-fashioned on the telling and summaries, but that’s intentional. My cyberpunk series skews more modern/conventional. So I do disagree that showing should be the default. What you’re writing should be considered, first. Also, as you said, genre and style can make a difference in expectations as well. Much of children’s literature skews far closer to telling than showing as well. One problem with trying to imply motivation (or anything) is that things can have multiple possible interpretations. Ilona Andrews’s Kate Daniels series was a major case in point, for me, where I had picked up completely wrong emotional undertones for some things until some side vignettes from another character’s perspective enabled me to figure out what they’d actually been going for. A very clear and excellent summary of something one rarely sees explained. The assumption is that writers will know when to show and when to tell. But we don’t always. Bookmarking this for future reference. A good example of why rules about writing should never contain “never”. Sometimes the narrator is researching, or thinking, and has to tell. Many authors provide a sidekick or familiar – like Lyra’s Pan – so the character can talk their ideas through with someone. But yes, action and new characters should be shown. A good balance is needed. Actually, I think I will have to do more telling/ summarizing of my characters’ dialogues because they’re so long… The reader will lose patience with me. Like real people, my characters spend a considerable amount of time discussing with their teammates what action to take next. I really should sum up some of this instead of showing almost every single line of dialogue they say! Hmm maybe it’s because I’ve been most deeply influenced by children’s, middle grade, and YA books, so I’m more in favor of telling emotions than many other writers are. Showing draws too much attention to the emotion, imo, so I think I should be selective about which emotion to show. More common showing phrases like “smiled” or “crossed their arms over their chest” can be used more often, since they are THAT common and are thus less attention-grabbing. Sometimes, I like to mention metaphors or similes, to show how a character feels in a more precise and vivid way. (This is a technique I learned in my counseling and psychotherapy program, actually.). However, these vivid images again draw a lot of attention, so I would use them sparingly. This is just my opinion, though. I’m sure many others would disagree with my approach.